We flew into Las Vegas, saw the Hoover Dam and the Grand Canyon as part of our descent into town, picked up our Jeep (later for #jetlag!) and headed straight for the wide open spaces of Death Valley. Yes, Vegas was on the to-do list, but I’ll have to tell you more about that in a later post. After spending many, many hours in airports, on planes, staring at screens and under fluorescent lights it was absolutely magnificent. Suddenly, we found ourselves in the single most vast, desolate and breathtakingly quiet space we have ever experienced. I think the contrast probably made it all feel so much more intense, but I can’t imagine anyone being unmoved by the sight of Death Valley. It might not sound beautiful, but it is magnificent and breathtaking in its’ desolation. On our way from Vegas into Death Valley we stopped for petrol gas in the oddly-name town of Pahrump. The road into town was not only dominated by Trump billboards, I was also treated to a bonus round of pretty hectic anti-Islamic graffiti in the gas station ladies room. Oh, and the gas station store had slot machines in it. ‘Nevada, duh,’ I said to myself as I pushed past a crocodile-skinned man. Dirty blonde hair stuck out from under his worn trucker cap, as he sat hunched over a machine. In the US, you hire a car in a certain class and when you head out to the parking lot, you often find all the cars are parked with keys inside them. Waiting to be inspected and then claimed. We got into all of the SUV’s on offer, pushed buttons and tested sound systems until we selected this Jeep. She took us all the way through Yosemite and Napa, onwards to San Francisco. 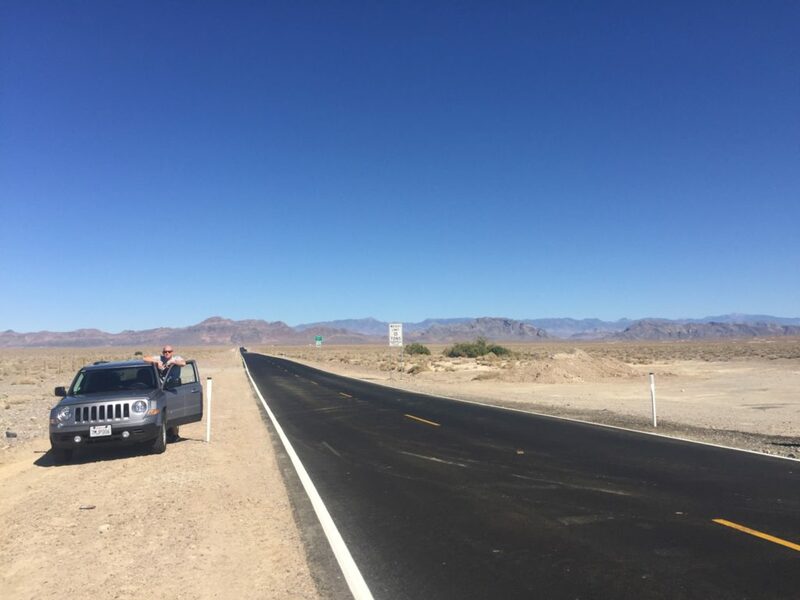 We crossed the border into California soon after, via Shoshone and the Death Valley Junction. 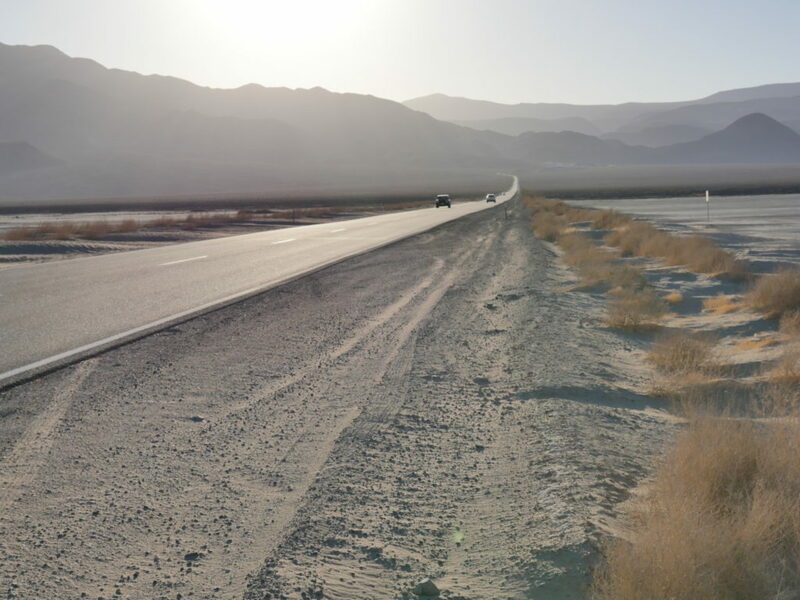 You then take the 190 into Death Valley, but keep an eye out for the turn-off to Mount Perry on the left. This makes for a VERY worthwhile little detour! Up to this point we had seen plenty of Nevada dessert scenes, but nothing could come close to just how much the earth opens up ahead of you, once you reach the top of that ridge. 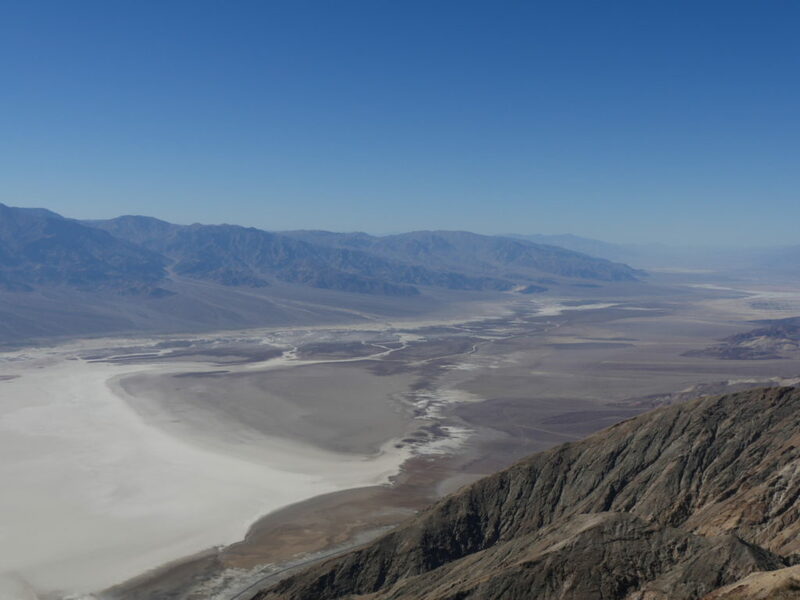 The Badwater Basin. Death Valley. Apparently the water in the basin is bad, i.e. undrinkable, because of the accumulated salts in it. However, certain forms of life survives in it. You wouldn’t know this from looking out over it, however. Death Valley is 86m below sea level (Joburg is about 1750m above, for the sake of comparison) and there was not a living thing in sight. Except the tiny dots soundlessly speeding along the tar snakes mapping the valley floor. 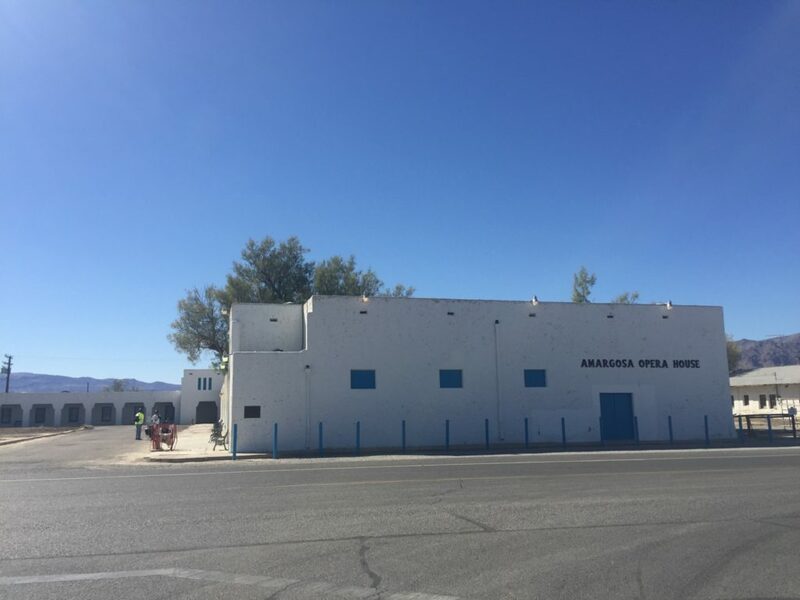 Just a snap from my phone, as we passed the Amargosa Opera House, constructed in the 1920s. The town of Amargosa had 350 inhabitants at its’ peak, largely thanks to Borax mining in the area, as well as the railroad crossing. From here we drove onwards through towns with names like Independence and Tom’s Place to where we spent the night, in Mammoth Lakes. That you can make it from 86m below sea level in the valley all the way to Mammoth in one day is notable, since the Californian ski town is perched 2400m above sea level. In fact, you’ll find it’s a great stop right before you enter Yosemite National Park from the east (another stop on our route, still to come). This route boasts magnificent changes of scenery, climate and many natural wonders. And to think, day one merely scratched the surface.